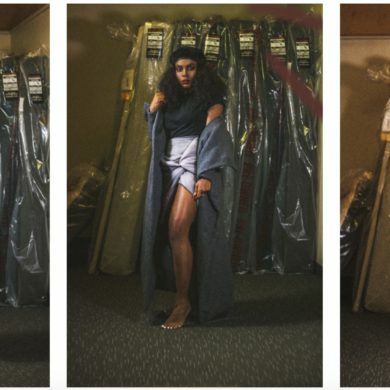 I spent three months this summer interning for Brooklyn based designer Tara St. James. Since it was such a short period of time to keep four interns (two of which flew in from overseas) busy and interested, she came up with Study Hall. She gave us the opportunity to design mini collections to be produced and sold under her label, Study. Working closely with Tara we learned how things work behind the scenes. She gave us access to her resources including everything sustainable and organic like textiles manufacturers, buttons, trims, hangtags, and dead stock items. Tara also introduced us to her contacts in the industry from her sample maker, photographers, retailers, wholesalers to her favorite makeup artist who even uses organic beauty products. It was a great exercise in learning the NYC garment trade as well as facing the inevitable problem of coping with tradeoffs in design and production. For my collection, “Emily Amorello for Study” I further developed designs that were inspired by the Gulf lifestyle and infused them with an urban NYC twist. The collection consists of one look in two color ways. I worked with Brooklyn based knitwear designer Lauren Jones of My Dear Thing to develop the origami blouse into a sweater made from silk tape yarn. I was also encouraged to think outside the box so I decided to design my own pattern to be printed on silk twill and silk jersey. In addition to my custom print and yarn, I employed a PET/ Hemp twill, a soy/organic cotton and a tencel/organic cotton blend. As I am committed to working responsibly and ethically Study Hall was an equally awesome and difficult experience that has brought me one giant step closer to my career and design goals. If working in sustainable/ethical/eco design is important to you too I encourage other students to find one of the many designers forging ahead in this industry and offer to intern for them as they are erecting a platform for us to build on in the future. I have since returned to Dubai for the Fall semester and so I can also highly recommend FSH 699 Sustainability for Fashion Design. What is your favorite thing about NYC? As a designer, my favorite thing about NYC would have to be access to so many resources! Here in Dubai I have to be very careful how I design as everything is imported and manufacturing is limited to working with local tailors. It was also amazing to live with my brothers in the East Village and catch up with friends and family. Living an expat life means only seeing your family every 24-36 months so every moment counts so I had to strike a balance between work and family. How is NYC different from Dubai? I can’t even begin to count the differences but this trip back I learned what it is to hustle in NYC. Between the heat and urban planning, there is very little walking done in Dubai. However, in New York the fastest way anywhere is on foot or bike, both of which were my daily commute around lower Manhattan after which I’d hop a train. You have to be savvy and fit to make it all happen in NYC. Tell us about something funny or silly that happened to you this week: An air hostess called me “sir” to get my attention away from the window. She quickly, replaced it with “madam”. First time in over of year of rocking super short hair that was mistaken for a dude — at least that I know of. What is your dream job? To design for an ethically minded, sustainable fashion house, preferably my own. What is the most embarrassing item in your closet? Anything with the price tag still on. oops! What is your must have item? Thai fisherman pants. Where have you found inspiration lately? Nature. What is your most valued possession? My family — pups included. List a person (dead or alive) whom you would like to have coffee with: That’s a toss up between my grandparents and Bob Marley.